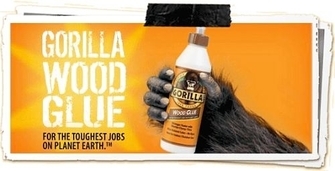 New Gorilla Wood Glue, bonds stronger, faster for wood to wood applications. Its hard working and long lasting. Your wood glue just got a lot tougher! What's more, its special formula was created for a variety of wood surfaces, is water resistant and has no dyes for a better looking bond.